In December 2017, Desperate Housewives alum Eva Longoria and her husband Jose Antonio "Pepe" Baston announced that they were expecting their first child together. The 43-year-old actress and Baston, 49, the president of Televisa, the largest media company in Latin America, dated for two years before getting engaged in Dubai, UAE in 2015. When they were first introduced by a mutual friend, Longoria admitted that "there was no real connection." "I was getting out of a bad relationship, and he was getting out of a relationship, so there wasn’t a connection," the Overboard actress told People. "So, we had a pleasant conversation but there was no real connection." Then six months later, something changed when they were re-introduced by the same friend. "I had no memory of meeting him the first time, but we had immediate sparks,” Longoria recalled. "It was like the cliché angels singing and there was a glow around him and it was immediate chemistry." "He was the most handsome man I’d ever seen,” she continued. “He was so charismatic, charming, sweet and funny. I thought, ‘Who is this guy? !’"
Three and a half years later, the pair tied the knot in a sunset ceremony in Mexico, and marked the occasion with a lavish party that ended in fireworks. Several A-listers, including Victoria Beckham, Penélope Cruz, Ricky Martin, Katy Perry, and Mario Lopez, were in attendance. Through her marriage to Baston, Longoria became a step-mom to three children from his previous marriage. “They’ve been such a gift in my life,” Longoria said, adding that although she isn't adamant on having a child of her own, a baby would be "icing on the cake." "I don’t feel like we are lacking because we don’t have a baby," she added. Longoria, who was married twice before, has previously talked about the idea of having kids after the age of 40. "I just turned 40, so I have thought, ‘Is time running out?’" she said back in 2015. "I should be thinking about [children], but I feel like my life is full." Three years later, Longoria is getting ready to start a new chapter of her life as a mom, and she threw a big party to celebrate. Longoria was surrounded with lots of love, gifts and treats during her pajama-themed baby shower at the Lombardi House in Los Angeles. "Eva wore a strapless, white dress and was glowing. She kept laughing and touching her baby bump. They played several baby games and Eva was in the best mood," a source told People. The mom-to-be wasn't the only one who was spoiled and pampered during the event. Guests were also treated to neck massages, hair and makeup touch-ups, as well as manicures as they sipped on wine cocktails. To say the guest list was star-studded would be an understatement. Many of Longoria's close celebrity friends and former co-stars were present, including Marcia Cross, Sophia Bush, Elizabeth Banks and Roselyn Sanchez. 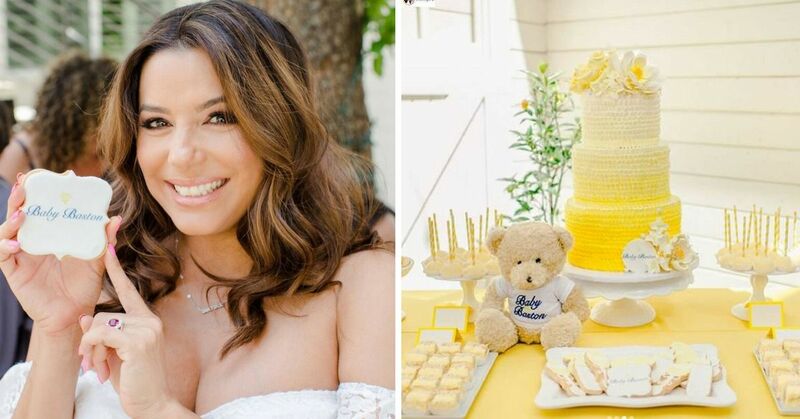 Instead of the usual blue or pink, Longoria picked yellow as the main color of the baby shower. The huge three-tiered yellow ombre cake was the centerpiece of the dessert table. The confection was surrounded by cookies in different shapes with "Baby Baston" scribbled on them. 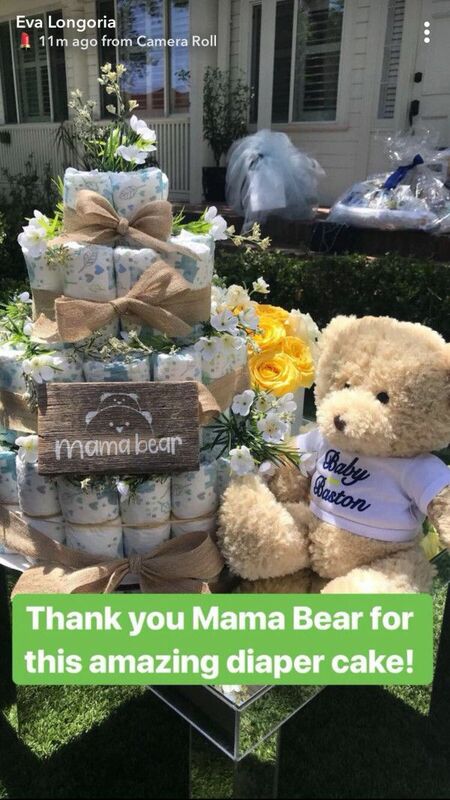 Longoria, who is registered on Amazon's Baby Registry, took to Snapchat to give fans a glimpse of some of the gifts she received, including a giant diaper cake from Mama Bear. The expecting mother also received plenty of other baby must-haves from Amazon, including a stroller, car seat, clothes, teddy bears, and books. "At the end of the shower, Pepe showed up and Eva got very emotional. He thanked the guests for coming and said that they can’t wait to meet their baby. 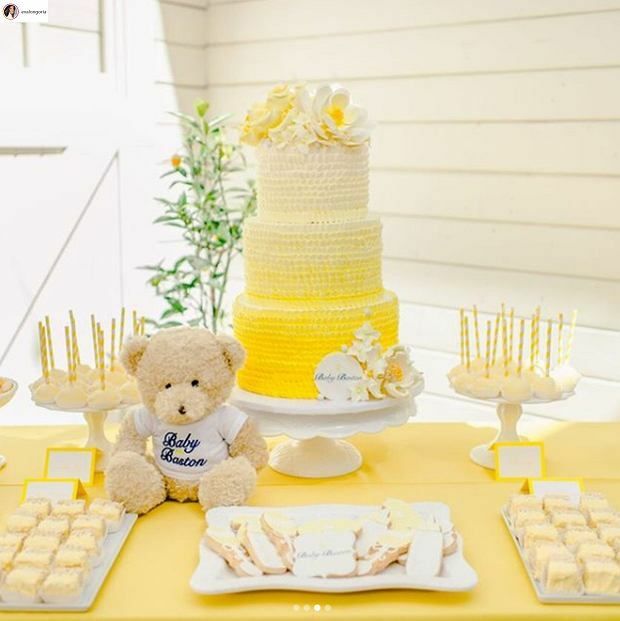 It was a very special baby shower." 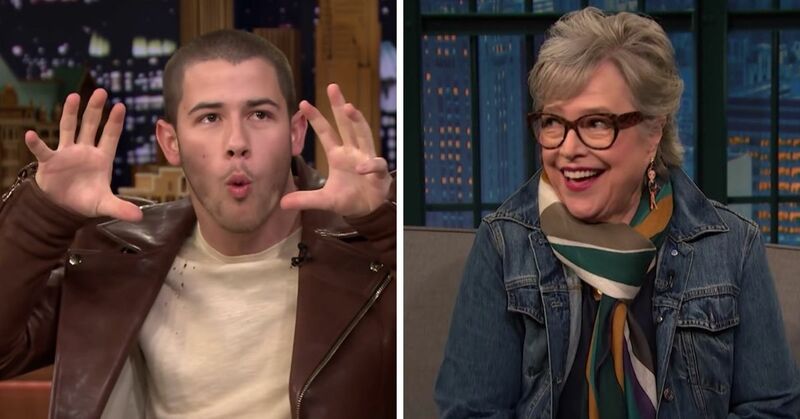 Actress Melanie Griffith caught the surprise on camera and later posted the sweet video on her Instagram page. "Pepe surprised Eva at the baby shower!" Griffith captioned the video. "Such beautiful love. Soul mates. Happiness, connection, love, all is right in their world. True love!!" Partygoers who won a game were rewarded with Mama Bear gift baskets filled with essentials. 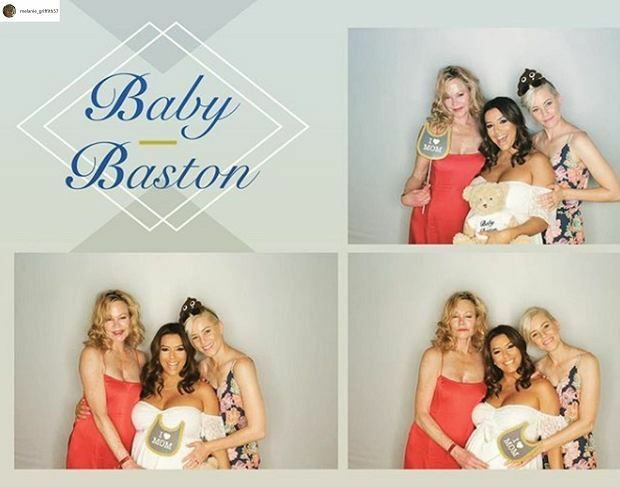 They were also able to enjoy some fun with props in the photo booth, and take personalized "Baby Baston" teddy bears home. 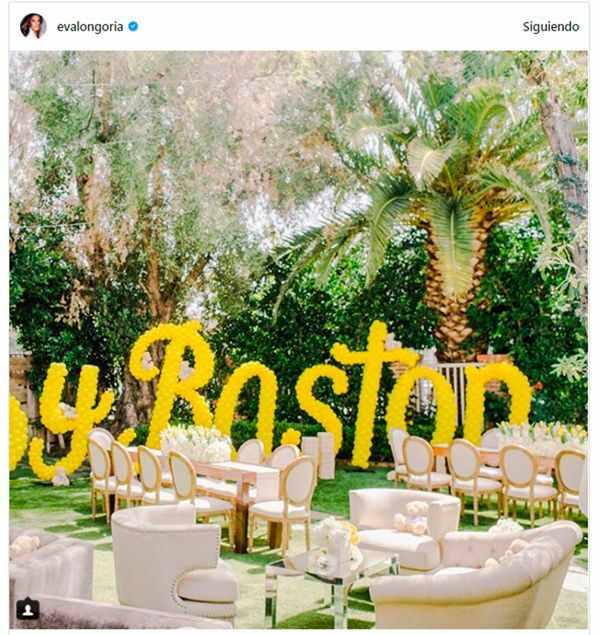 At the end of the eventful day, Longoria shared a couple of photos of baby shower on Instagram, along with some sweet captions. "What a beautiful day with all of my girls!" she wrote in one of the captions. "Thank you for your constant guidance and support! I love y’all so much! 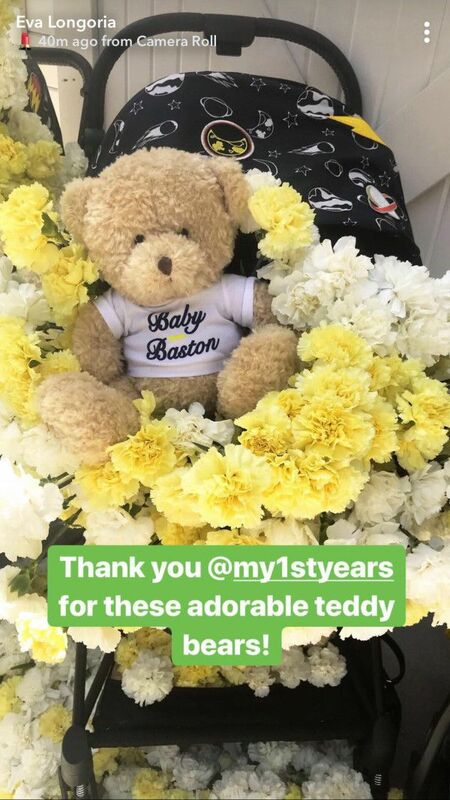 #BabyBaston#BabyShower"
Back in February Longoria revealed to People that she's "in the golden months" of her pregnancy, adding "I’m full of energy, and the hard part of the first trimester is over." She said that she can't wait for her son to get here, and that she's ready to "embark" on the journey. "I don’t know anything about the mom world even though I have a lot of nieces and a lot of girlfriends with kids,” she said. “I’ve been reading, and it’s a lot of information and things to absorb." At the time, Longoria told the magazine that she was "lucky" that most of her pregnancy took place in the winter because she was able to easily hide her bump under layers of clothes. "Now that we’re getting into spring and I’m going to be getting bigger, I’ll have to have a new approach," she said. Well, Longoria won't worry about her bump for too much longer because her son is due later this month. Congratulations to Longoria and Baston! We can't wait to see photos of their bundle of joy.